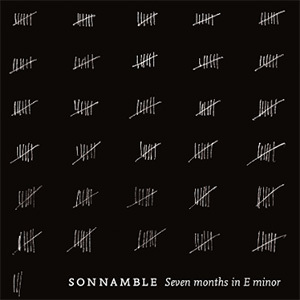 Sonnamble is originally the project of London-based software designer and musician Conor Curran, who, after completing his music studies at Trinity College Dublin, has been involved with a number of projects, including his solo work as CjC. With Sonnamble, Curran aims at exploring the possibilities of live digital processing in improvised music. For this debut release, Curran teamed up with bass and guitar player Peter Marsh. The pair spent the best part of a year developing an approach that allowed them to process their respective instruments and incorporate the resulting sounds into substantial music compositions. 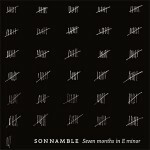 Sonnamble weave intense granular textural soundscapes, processed live from heavily treated electric and lap steel guitars, double bass, electric bass and analogue synthesizers, into beautiful introspective sparse pieces which all share a particularly abstract aesthetic. While guitars remain the primary focal point of the seven improvisations collected here, they are presented in a multitude of forms throughout, at times appearing in almost bare natural state, with very little treatment applied, as is the case on Opening or, to a lesser degree, on Sehnsucht, at others processed beyond recognition, their aural materiality ultimately amalgamated into the overall fabric of the record. While references to Fennesz or Machinefabriek seem almost unavoidable, there is a certain earthiness here which is rarely found in records of this type. With the processing done on the fly, as the improvisations take shape, there is very little margin for error, yet this never transpires at any point on the record. This is perhaps the result of months of collaborative effort, yet there seem to be a strong understanding and respect between the two musicians, which render the music extremely fluid and light and allow them to make it all sound like a very organic course. Instead of relying on ever increasingly sweeping slabs of distortions and noise to flesh up their pieces, the pair choose to focus on the more intimate and delicate nature of their instruments, often magnifying minute sonic details or incorporating elements that would all too often remain unnoticed otherwise. This level of attention to details is also reflected in the complexity of the sound formations put together by the pair, especially on pieces such as Trasnochar, Knock Knock, Nocturne or Heal, which all feature some micro sounds and textures, some placed in evidence, others appearing more discreetly, weaving in and out of the backdrop or permanently set deep into the sound structure of a piece. Seven Months In E Minor is a record which unveils its profound beauty with great care, and requires a level on commitment to fully appreciate its depth. This said, the great ease with which Sonnamble arrange the various components at their disposal into consistent pieces and the deep level of understanding between the two musicians makes it a wonderfully enjoyable record.